All organisms compete for space. Dragonflies patrol coveted oviposition sites, red-tailed hawks defend territory with threatening aerial displays, and chimpanzees raid neighboring groups in aggressive competition. Even your dog urinates to mark his presence, an instinctual behavior that has not been lost in domestication. Yet competition also occurs on small scales, between plants in sidewalk crevices and oysters on seawall ledges. While scientists have come to understand many of the complex interactions that occur in competition, a wide-range of unanswered questions still remain. In marine communities, natural and man made surfaces provide important habitat for many sessile species. This is where the competition takes place. Like succession in a forest, these areas evolve through various stages of settlement – some organisms arriving and taking hold at first only to be later overtaken by other dominating species over time. Performing research on these complex interactions allows us to better understand marine environments and more importantly, the effects of human activities on ecosystem diversity and health. In her research, Mollie Thurman explores how species assemblages affect the recovery of marine sessile invertebrate communities over time. This information will allow scientists to better understand the impacts of physical and chemical disturbances on marine organisms and their habitats. Mollie Thurman (’13) joined E3B after spending several years as a research assistant on various ecological evaluation projects. At the Harvard School of Public Health, Mollie looked at the effects of the Deep Water Horizon oil spill on seafood quality – examining pre and post spill fish samples. This experience in marine ecology inspired her work as a graduate student and interest in marine conservation. Mollie is an experienced kayak guide, Massachusetts native and avid singer-songwriter. She will be deciding on a career path in science research and conservation after graduating this May. Where was your research site this summer? What were your day-to-day activities? My research site was in Gloucester, Massachusetts, a small town on the North Shore with a long history of fishing and shipping. Like most industrial ports, the chemical and physical disturbances that occur here directly affect the marine environment and its resident aquatic organisms. For my study, I asked how small scale physical disturbances affect communities of sessile aquatic invertebrates in this highly degraded setting. My communities were comprised primarily of two groups: ascidians and bryozoans. More commonly known as sea squirts and moss animals, these are filter feeding organisms, whose life cycles bring them to settle on rocks, floating debris and boats. By using artificial plates for them to grow on, I was able to control the level of disturbance and then observe the resulting effects on recruitment and regrowth. Specifically, I wanted to determine how the magnitude of disturbance affects how an assemblage recovers following a physical disturbance. Would a plate with a larger disturbance recover differently than one with a smaller disturbance? In terms of daily activities, I spent time building the plates, setting them in the water at the site, checking the growth (most were covered after one month), scraping sections to simulate disturbance and then examining the species assemblage post-disturbance. How do industrial activities occurring in costal areas like Glouster affect the surrounding environment? Industrial activity can affect marine environments in many ways. The most common, however, is an alteration of and negative impact on water quality. In Gloucester in particular, there is a lot of pollution from anti-fouling practices. Fisherman and other boat owners will use anti-fouling paint to keep organisms from settling on hull of their boats. Contaminants like these not only damage water quality, but also create selective pressures that allow only certain species to survive – decreasing overall diversity & increasing the percentage of organisms that are highly resistant. For example, there is specific species of tunicate that can live on copper paint and comes to dominate these surfaces in marine areas. 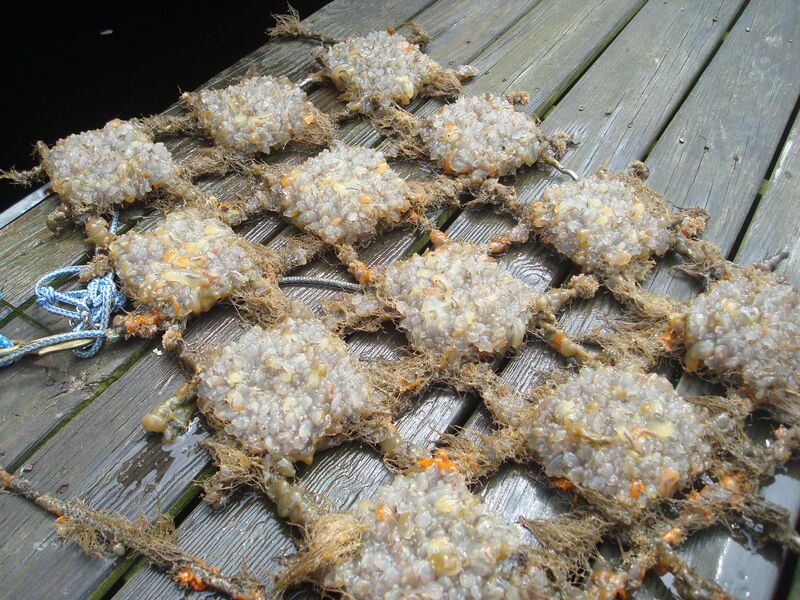 In these ‘altered’ environments we have created support invasive species that most often outcompete native ones, negatively affecting port harbors both ecologically and economically. You were working in a very residential area of Massachusetts. What sort of interactions did you have with the people living there? 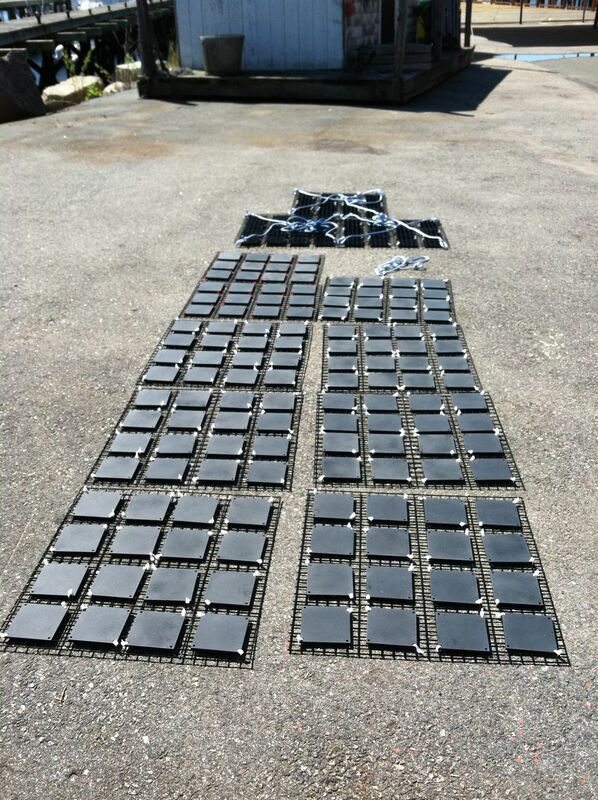 I conducted my fieldwork on a public dock in downtown Gloucester. Since I was working with organisms that are unfamiliar to most people, I was constantly asked questions about the slimy things I was photographing. 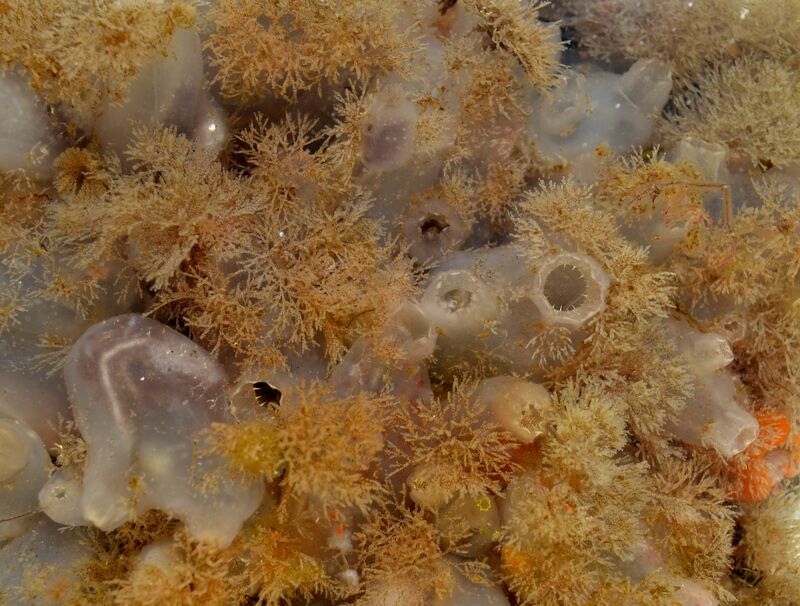 The most abundant organisms I found were the ascidian sea squirts. They’re given this name for a very obvious reason – when they are touched, they squirt water up into the air. When introducing people to sea squirts I would encourage them to feel their skin and as they did the sea squirts would squirt seawater at them. The amazing thing about this was that everyone, from ages 3 to 83, would respond the same way. They’d get a surprised look on their face, which would instantly turn into a big smile. Communicating the importance of marine conservation seems to be an important part of your research. In what ways have you had the opportunity to share your work? Working directly with Maritime Gloucester allowed the opportunity to interact with the public and share my research in many different ways. I was able to work with several of the local student interns and through my own work, give them a chance to think about experimental design and marine fieldwork. 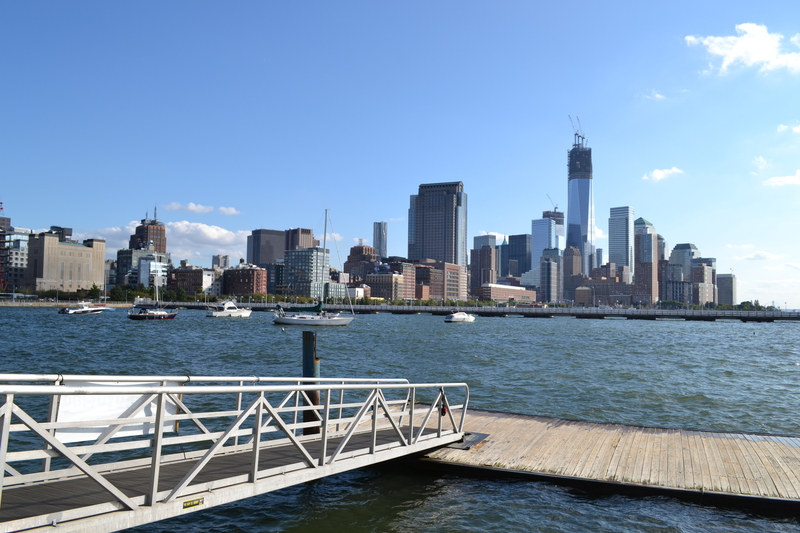 I’ve also had the chance to be involved with several marine conservation projects here in New York City. In September of last year I joined other students and volunteers to help restore the waterfront at MacNeil Park in College Point. Do you have any preliminary results to share? The major trend I’m seeing is that there is no significant difference between the beginging and end species richness or even percent cover of certain species. In other words, regardless of the magnitude of disturbance, all tiles finish with the same community – ending up at this ‘final succession’ point. The tiles would start with around 7 species and end with only 4 or 5 dominant species. The only time this did not occur actually came about on accident, after I left a subsection of my tiles out in the sun for five extra minutes. This exposure killed one species, Diplosoma listerianum, which was particularly susceptible to desiccation. The loss of this dominant competitor significantly altered the species composition. Because of this observation, I’m in the process of planning a follow up study that would involve a targeted removal of this species. 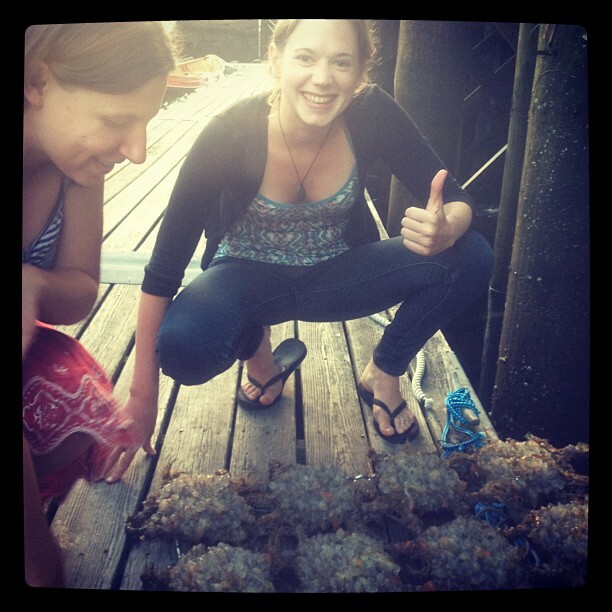 You can learn more about Mollie & her research in this outreach video from Maritime Gloucester!